GRAVES WORKS LINK - Graves Motorsports Kawasaki ZX6R Full Titanium WORKS Exhaust System with Carbon Fiber Silencer. Graves Exhaust systems are designed for the elite rider seeking top of the line performance, fit, finish and value. This ZX-6R exhaust system was developed using the same technology that has powered the Graves Racing Team to 23 Professional AMA National Championships including 8 Superbike Championship titles! This product is intended for closed course competition use only. Use of this product for any other purpose is strictly prohibited. We did not compromise in the development of this system. This ZX-6R Race Spec Full exhaust system includes a long aggressive tapered head pipes. Material diameters, lengths, the silencer core size and length are optimized for maximum power output throughout the throttle and RPM range. Combined with Graves’ exclusive flash tune map this system produces a solid 11+ HP in the midrange and 13+ on the top of the horsepower charts. This tune also removes any computer error codes the bike will have when installing performance exhausts. 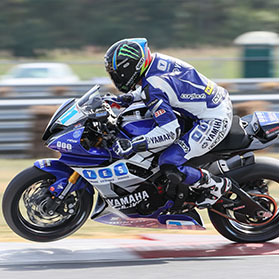 We use the same 1.00 MM thick wall high heat grade Titanium tubing used on our Superbike exhaust systems. This material is designed special for maximum durability and oxidation resistance up to 800*Celsius / 1472*Fahrenheit. It is designed to live at almost twice the temperature of normal Grade2 Titanium. The tubes are precision bent and cut with the latest equipment available. The tubing is then welded in fixtures designed so that repeat-ability is second to none. It comes with a single Lambda receiver bung for on track data logging or Dyno tuning. The spring tabs are made from 4MM thick Titanium wire for long life. The silencer's carbon fiber body is attached to the Titanium entrance cap and a deep draw 60* slash cut titanium exit cap and is attached with stainless aircraft grade rivets and Titanium silencer bands.. The silencer is hung with a strapless titanium tab built into the systems tubing. The inter core tube is made of stainless that slips over the entrance and into the exit cap. Diamond Shaped Silencer Design (Carbon Fiber silencer body with Titanium End Cap), configured to balance the ZX6R's body lines and produce the best balance of power. Tapered header down pipes (Cores are altered in size and taper length for each motorcycle. Optimized Graves Spec flash tune maps available with product purchase (product shown below in up-selling links). Stock Exhaust System = 24.8 lbs. This new ZX6 BIKE is fast! I added the pipe and was emailed a tune from Graves direct. Put it to my FTecu flash and gained 14 HP verified on a dyno. The air fuel was spot and also. So stoked on this new bike and exhaust.